It's Children's Book Week in Australia - YAY! 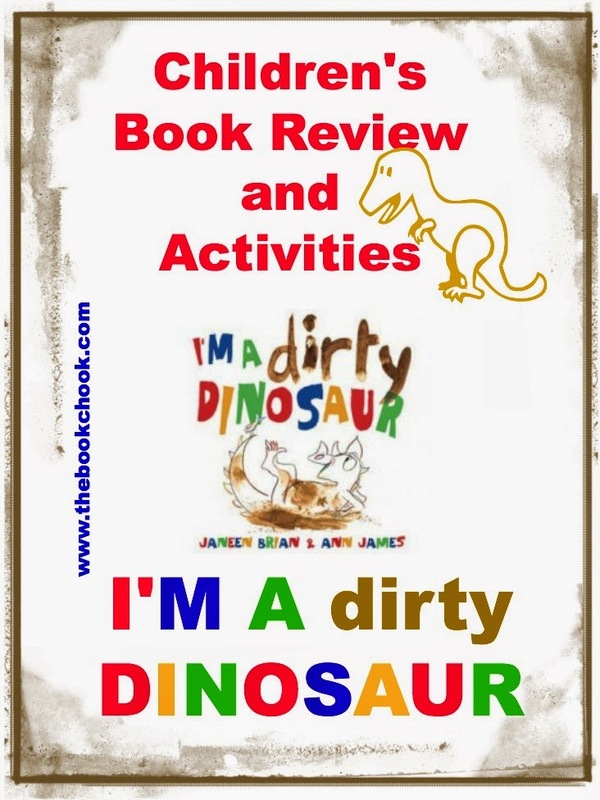 What better week for me to review I’m a Dirty Dinosaur, a children’s picture book, written by Janeen Brian, illustrated by Ann James and published by Penguin Books Australia, 2013. Janeen Brian is one of my favourite Australian children’s writers and poets. Her background as a poet is one factor that makes this an excellent children’s picture book. I also think Brian’s background as a teacher is evident - surely she has envisaged the way the rollicking rhythm and rhyme will “stick” in children’s heads until they are convinced they can “read” I’m a Dirty Dinosaur for themselves. This intermediate step of memorising the text is such an important one for young readers, and I love to find flawless rhyming children’s picture books that encourage it. Ann James’ illustrations have great child appeal. I love the footnote that explains she ‘…worked with magic pencil, mud and watercolour.’ Ah, if only I had a magic pencil! Her work is perfect for the text - it has lots of energy and movement with minimal lines and lots of lovely mud. Can children notice the little bird in each illustration? The book designer has really brought to life the pages I think of as the chorus - large colourful words, all in capitals, a contrast to the main narrative. I adore the rounded book corners. I'm a Dirty Dinosaur has been shortlisted for the CBCA's Book of the Year - Early Childhood. (UPDATE: It's now an Honour Book!) It also receives the coveted Book Chook Feather of Approval. If you're interested in Children's Book Week in Australia, you might like to read Activities for Children's Book Week 2014 and Last Minute Ideas for Children's Book Week 2014. Here are some activities you might like to do with kids to follow up your shared reading of I’m a Dirty Dinosaur. *Look at the vocabulary in the book. Lots of words make wonderful pictures and sounds for us. List them and discuss them. Take a look at phrases like “flick it in the muck” and “slide it like a snail.” Have kids experiment with saying the phrases in different ways. Older children might notice that the short vowels and hard ‘ck’ of ‘flick’ and ‘muck’ contrast with the long vowels and sibilance of ‘slide’ and ‘snail’. Can they translate that contrast using their bodies? *Senior primary kids could certainly use this picture book to explore poetic devices like alliteration, onomatopoeia, and assonance. But that doesn’t mean younger kids can’t play with the words. Perhaps they might look at the model of ‘dirty dinosaur’ and came up with their own alliterative animals - ‘dancing dog’ and ‘twisting tiger’. Add in synonyms for dirty with older kids and you might find ‘mucky monkey’ or ‘filthy ferret’. Can they find some with the exact rhythm of ‘dirty dinosaur’, perhaps ‘empty elephant’ or ‘cranky crocodile’? *I’m a Dirty Dinosaur is perfect for performance. Divide a class into groups and ask kids to work out ways to present it. After their presentations, discuss ways to make the communications more effective. Consider voice, props, setting, bodies, movement, actions, faces, eye contact, adding percussion and/or instruments, body percussion, dividing the text, repeating certain parts… Try again and refine until presentations are ready for an audience. *Try I’m a Dirty Dinosaur as a choral piece. Experiment with rhythm and repetition. Consider having a group of kids reading the main narrative, and then the chorus coming in with the pages in capitals. Consider having one group establishing a beat with stamps and a vocalised ‘stamp’ behind the narrative, then everybody join in for the LOUD chorus. Play with some of the ideas in the activity above to add movement and life to your choral presentation. *Have kids experiment in creating their own dinosaurs with pencil, mud and watercolour. How do they think James applied the mud? Before or after the sketched dinosaurs? How can they get a lovely splashy effect? Can they add a flower, a bird and a dragonfly to their pictures? If children have toy dinosaurs, they could create a lovely muddy place for them to play in the playground or park. Check out this simple but effective dinosaur outline plus mud TL Lynette did with Kindergarten students. Perhaps I’m a Dirty Dinosaur should have come with a warning sign? The riot and rumpus this book produces, the fun and games it encourages surely merits some kind of warning to staid passers by? Come to think of it though, I didn’t notice any raised eyebrows at my local library - I was too busy shaking my dinosaur tail, and roaring and rampaging with the rest of the kids. Find more Children's Book Reviews by clicking Reviews in the right sidebar, or follow my book reviews board on Pinterest. Find all my boards on Pinterest. Thank you, Susan, on behalf of Ann James and myself, for such a lovely, warm and wholehearted review and suggested activities! PS: Look out for 'I'm a Hungry Dinosaur' coming out next year!